Here it is – the innovative pain treatment which millions of patients have been waiting for: IVT. The effective and inexpensive way to decongest postoperative or post-traumatic swelling (e.g. lymph oedemas after mamma ablation). It is easy to apply and accelerates regeneration and rehabilitation (post op. and post. traum.). Unbeatable and with a surprisingly fast effect in the therapy of chronic pain such as RSI* or CRPS**. IVT causes a rhythmic dilation and compression of the vessels and capillaries. Physically this increases the circulation, the venous reflux and the disposal of lymph and lymph-dependent waste products. Fully automatically. 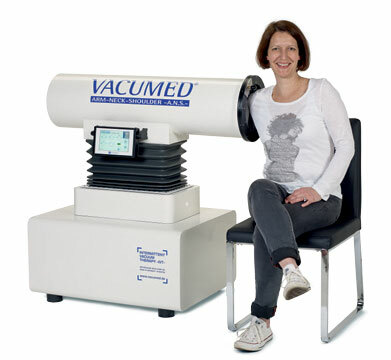 At the same time the intermittent pressure and vacuum waves provide vascular training which promotes the formation of new collaterals (capillarisation). So the supply and disposal in the treated area is additionally optimised and maintained with a long-term effect. The treatment parameters are intervals of pressure and negative pressure of varying length and different intensities of pressure. This means that the function of arteries, veins or lymph vessels can be triggered in a differentiated way. Nine fully automatic indication-specific treatment programmes are available. The pre-programmed settings guarantee “best practice” and make the therapy simple, safe and delegable to staff. For individual requirements there is a possibility of setting the treatment parameters manually. The duration of a treatment is between 25 and 40 minutes depending on the indication. The application takes place almost contact-free and is always experienced as pleasant by the patient. In pain therapy six to ten treatments within a period of three weeks are prescribed, as lymph drainage or rehabilitation acceleration according to need. Inpatients can be treated with IVT every day. 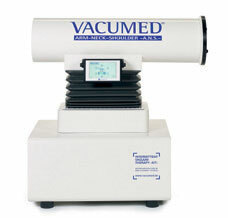 The innovative IVT with the VACUMED® A.N.S. is a highly effective, new type of treatment for chronic pain syndromes in the arms, neck and shoulders. The ideal locations apart from institutions for rehabilitation and physiotherapy are pain centres, internistic practices or institutions for occupational medicine. As oedema therapy or for rehabilitation acceleration the therapy is ideal for rehabilitation centres with a focus on vascular or orthopaedic medicine or sport medicine institutions. IVT helps to reduce the costs related to manual therapies in the framework of integrated care or DRG and to improve the quality of life of the patients.